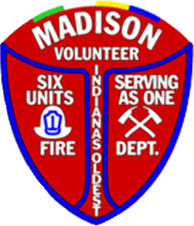 Throughout the years volunteer members of the various fire departments in Madison, Indiana have joined forces to battle blazes, protect property and save lives. 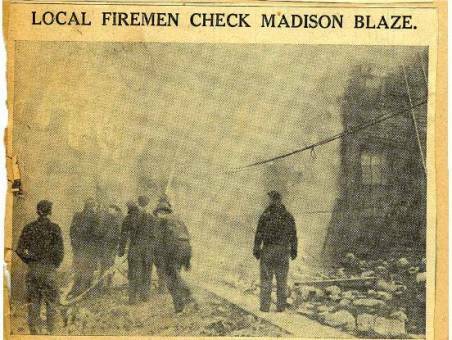 As we find historic facts and photos about the Madison Volunteer Fire Department, we will post them on this web page. If you have anything you would like to add to this page about the history of the fire department, please email contact@firecompany4.com. Indianapolis fire equipment and men helped avert a serious blaze in Madison when they extinguished flames at the Louis Perry home. Louis “Lou” Perry was a well-known band leader in Madison, and after retiring, worked at Demaree’s Clothing Store on Main Street. The Perry house was located on the west side of Mulberry St., between Third and Fourth streets, in downtown Madison. Two of Madison’s fire pumpers were used to maintain city water pressure during the flood emergency, and the Indianapolis equipment was already in Madison on-duty during the crisis. Washington Fire Company No. 2 and Western Fire Company No. 3 pumped water in the city water system at the plant where the Trolley Barn is located today on west Main Street. The following photos and captions made The Indianapolis Star newspaper during the flood of 1937. Above, firemen are shown battling the flames. Below, Captain H. N. Demerer (left) in charge of the Indiana National Guard detachment at Madison, talking to Fred W. Turner of the Indianapolis fire department. 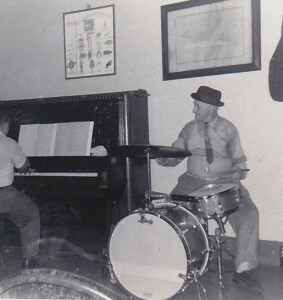 The late, great Charlie Warren playing drums at a party at Fair Play Fire Company No. 1 in Madison, Indiana. Fire Co. No. 4 History.